Sickamore with Patchwerk IdOMUSIC showcase host Sammy Approved. Artists, musicians, bloggers, stylists and more gathered at Apache café on Feb. 2 for Patchwerk’s first idOMusic showcase of the year. 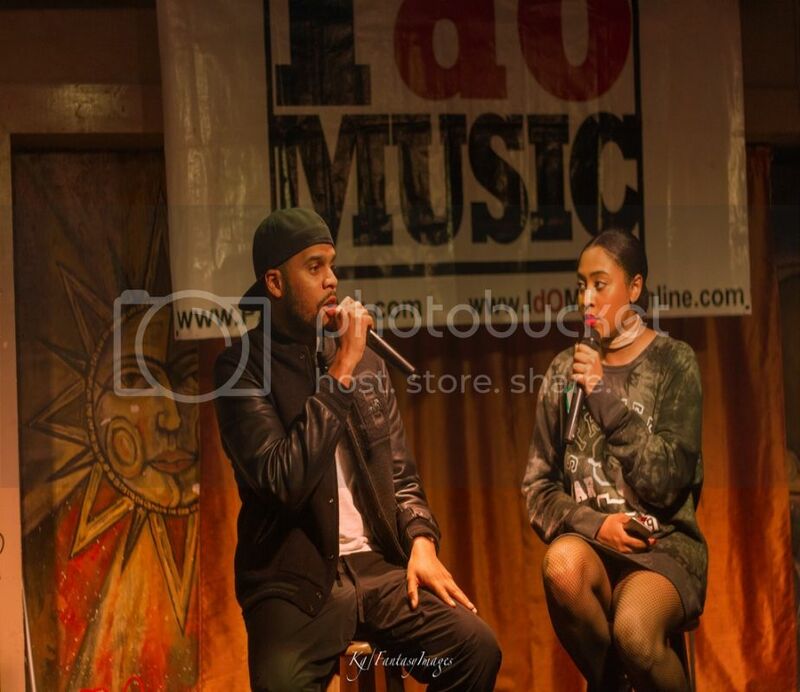 The networking event featured an open mic, spotlight performances along with discussions with a key member of the music industry – manager to YG, Travis Scott and others, Sickamore. Hostess, Sammy Approved began the event by announcing IdOMusic program updates along with encouraging the audience to mingle. Shortly after, eight talented individuals hit the stage for the open mic. First up was eighteen year old Zem singing an original piece. Her fingers glided across her piano with ease and though such a small woman, had a very powerful voice. The Patchwerk panel of judges was impressed and I personally thought of her as the “black Amy Winehouse”. Next in line was a woman who went by the name of, The Somalia Show. Her coffee shop feel and natural performance brought something a little different to the stage. Brandy Nichole who admitted to it being her first open mic, opened the audience up to a more sensual side in her performance of the song Hold it Down. The east Atlanta natives and first male performers of the night Azair and Yelir gave us a little more of a home-town feel in their song Fools Gold. Chicago native, Lost, began his performance by hyping the crowd to chant his name. Lost dedicates his movement to his grandmother and gave us a little inspiration and depth as he talks about his struggles in his performance. He also jokes about doing four years……of college that is. Sage from Brooklyn took the stage with her guitar and performed a soft spoken serenade entitled Mrs. Right. Sage impressed the crowd and judges by transitioning into a little rap mid-song (sort of like the great Lauryn Hill). With amazing stage presence and energy, the natural performer Queen Asheera enticed the crowd with her vibrant spirit. Panelists believed she “carried the essence of Brooklyn” in her strong choreographic deliverance of the song SunDrum. Kayne Prexise's soulful vocals ended the open mic with a song packed with romance. “Just the sight of you makes me weak” he eclaims diring his performance. Sicakmore dropped a few gems on us in an interview with Sammy Approved later in the showcase. Born in Trinidad and raised in Brooklyn, the natural born hustler started his career selling mixtapes around the city. At the age of 18 he rented a booth in a record store, adopted mentors, by 21 became an A&R at Atlantic Records and by 23 started his own company. “You’ve got their dreams in your hands” Sickamore describes when speaking on the duties of being an A&R. He tells us how his job is not just about listening to music all day but... 1. Identifying talent 2. Developing Songwriters 3. Finding concepts for albums and much much more. “Research and Routine”’ are the two main things he suggests to someone who wants to take a break into the industry as he has. Sickamore inspired the audience to not only figure out their own idea of success but encouraged them to set goals ALWAYS to get where they want to be. Following the interview with Sickamore, Sammy Approved introduced the Spotlight performances. Daytrius of southside Atlanta was first to take the stage and connects to the ladies in his performance of the song Show Out. Tyler Davis of Athens changes the mood with his song "I’m Shook" with a beat that literally shakes the venue. The duo, Young Treja and Damayo take the stage to perform songs Campiagn, Lingo, and Run That Check Up. Mickymundy from LA was up next, who switched it up a bit by spitting a couple bars before performing his song Legend produced by 808 mafia. "And I'm still fly as a blue jay, and I couldn't look better in blu-ray"
The MC of the month and the last Tight 32 contest winner, Big Will, introduced us to his “Trap Lives Matter” movement before getting into his set. The Virginia native gave us an old school hip hop feel while naming Just Blaze as one of his role models. “I sell dope too it’s just through the speakers” he says in his performance. The winner of the Tight 32 finale and brand ambassador for the entire year Preme Cordice ends the showcase with a few performances shouting out his little sisters and giving inspiration to all perfomers.